Dessert for breakfast! It's the French way. Basically as soon as we stepped out of the apartment, we were approached by a Frenchman who wanted to talk to us. I have absolutely no idea what he said because I studied Spanish for 11 years and French for zero. I know what I said to him, though. I meant to say, “Je ne parle pas français,” i.e. “I do not speak French.” But all that came out was “No parles,” i.e. “No talk.” Killing it on the tourist front already. 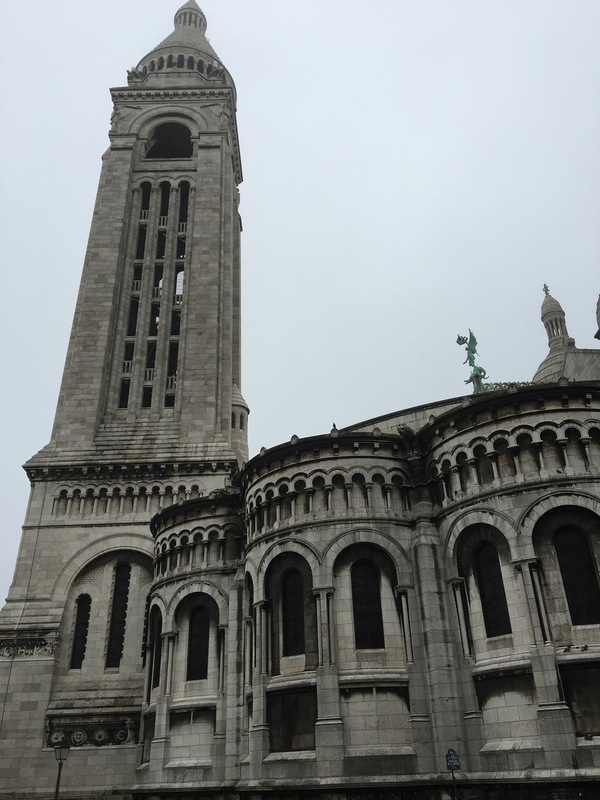 After that embarrassing encounter, we got our bread, packed some lunches, and headed to Montmartre to see Basilica of the Sacré-Cœur. (The French even have letters we don’t have!) 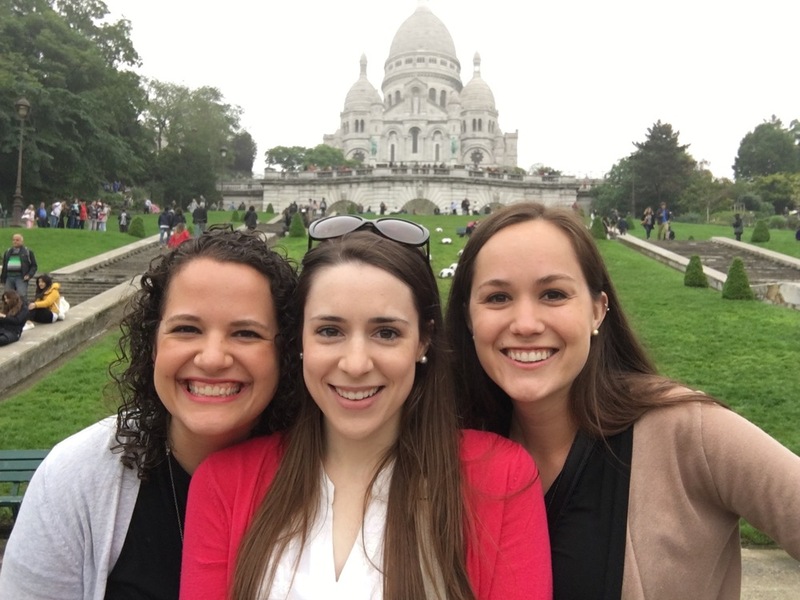 Montmartre is a little hilly village filled with tourists — and artists trying to sell art to tourists. But it’s also ADORABLE, so it makes sense that tourists would want to go there. And it makes sense why artists would want to go there, too, because it puts them in the company of Dalí, Renoir, Degas, Picasso, Van Gogh, and a bunch of other famous artists who lived and/or created in Montmartre. 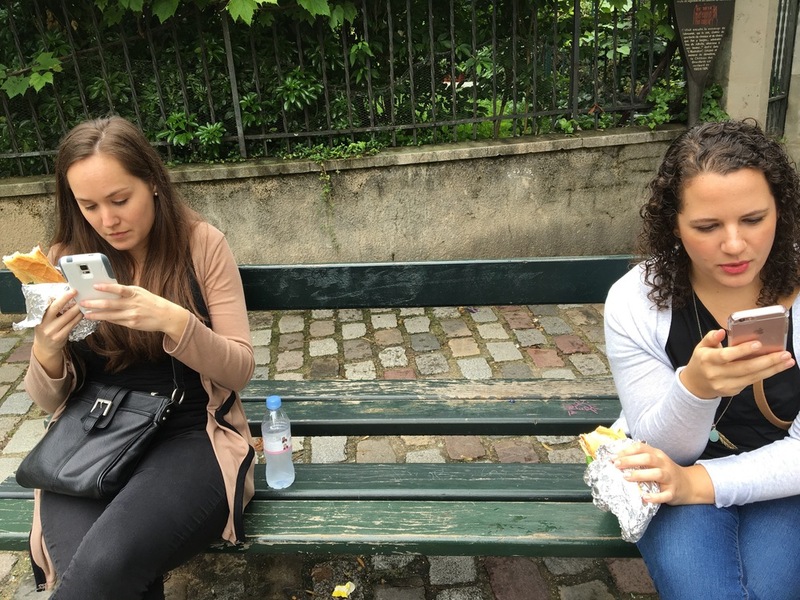 After exploring the village a bit, we nommed on our sandwiches before heading to see more art at the Musée Rodin on sculptor Auguste Rodin’s estate. 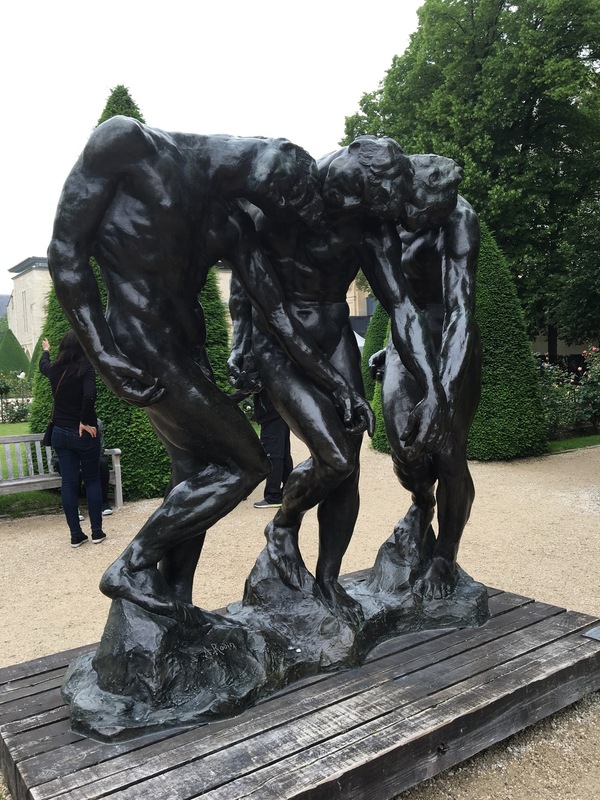 The Musée Rodin offered the first of many sculptures and pieces of artwork that we would see over the course of the week. I’ll probably reflect more on the overall experience of seeing artwork when I write about our trip to the Louvre later in the week, but I’ll still share a little now. 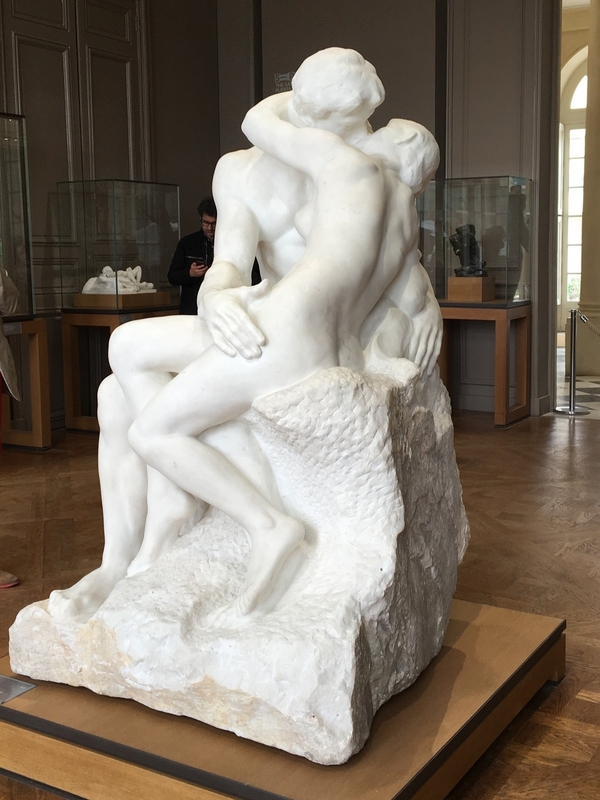 Rodin is probably best known for The Thinker and The Kiss. (As someone who’s not particularly knowledgeable about art, I was familiar with only these two pieces.) That said, I found his Gates of Hell to be the most interesting piece we saw on his estate. He worked on it for 37 years, all the way until his death. This sculpture, inspired by Dante’s “Inferno,” is of a pair of doors decorated in human bodies that appear to be in various states of distress or distraction. The longer you look at it, the more figures you see (many of which he created in larger form as well, and many of which were on display throughout the rest of the museum). The piece is haunting to say the least. I can imagine a mom here being like, "Honey, hon, honey, DON'T PLAY WITH THE CANNONS. CANNONS ARE DANGEROUS." I see you, Eiffel Tower. As we were leaving the tower, I had to be the person in our group who was like, “Sorry, guys, I need to use the restroom.” After a brief hunt, we found one. But this was not your typical public restroom. No, this was a self-cleaning restroom — like a self-cleaning fish tank or a self-cleaning oven, but a BATHROOM. In between each use, the bathroom closed its doors and rinsed itself from top to bottom. I still don’t fully understand the mechanics. I don’t have any experience in planning public parks, so maybe this is the wisdom of the childless, but I’m pretty sure that if I were planning the park around what's arguably the biggest tourist attraction in the world, I would plan for a public restroom that could accommodate more than one person at a time. Actual sentence on the Wikipedia page for these bathrooms: "Sanisettes carry a warning that young children must not be allowed to use the toilet alone as the weight sensor may not detect a small child, allowing the cleaning cycle to run with a child inside." At least this bathroom was free though. A few of the bathrooms we used throughout the week required us to pay them like vending machines. What good is socialism if you have to pay to go to the bathroom!?!? (What’s more of a basic human right: health care … or peeing? Answer me that.) Additionally, because space is at a premium in France, buildings expand vertically, which means that if you’re using a bathroom in a public building, you’re probably going up or down a spiral staircase to get to it. All that to say, I missed American bathrooms more than almost anything last week: big, brightly lit, complimentary American bathrooms. Land of the free, indeed. This has been around for three times as long as we waited at the self-cleaning bathroom. After waiting a millennium to use the self-cleaning bathroom, Marie and Taylor and I started heading across the city to meet Marie’s parents for dinner. They also happened to be visiting France while we were there, which was quite convenient. Along the way, we stopped at both the beautiful Pont Alexandre III bridge and the Place de la Concorde in the center of Paris. The Place de la Concorde is home to multiple historic monuments including the 3,000-year-old Luxor Obelisk, which Egypt famously gave to France in the 1830s, and the Fontaines de la Concorde, which Anne Hathaway famously threw her phone into at the end of the Devil Wears Prada in the 2000s. Important history, people. How we should all do salads. We soon arrived at the restaurant where we would eat dinner with Marie’s parents. Marie’s dad kindly read the menu to me. (Culture shock #5: Menus. Why did I always try to read the menus? There were only a few words I ever recognized. Tomate, for instance. Mozzarella. You might even think I’d recognize the word entree, but you’d be wrong because it means something different in French. SURPRISE.) 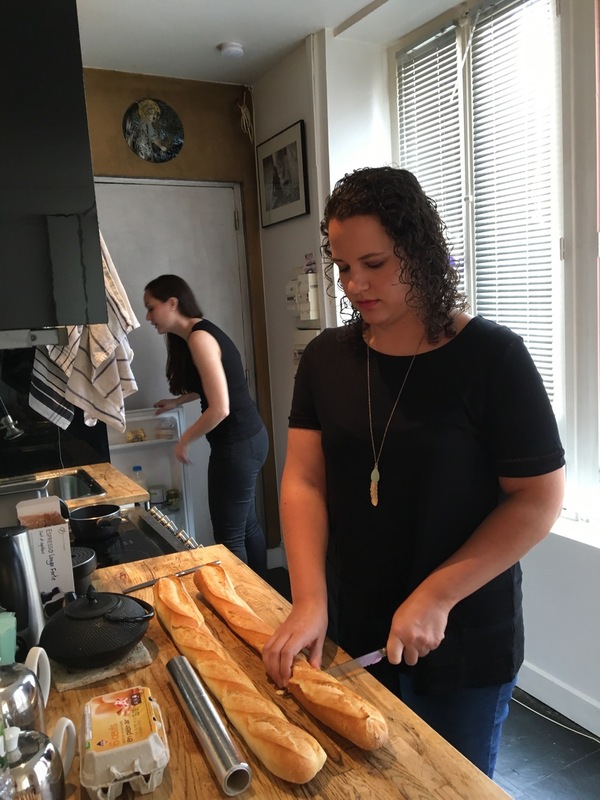 I could really get used to the French way of eating — long, lingering meals with multiple courses and lots of time to talk. I could also get used to the way French do salads, or at least the one I had because IT HAD BREAD AND CHEESE ON IT, people. They might be bad at bathrooms, but the French certainly know how to eat. After dinner we strolled around the Jewish quarter before heading back to our apartment and calling the day … a day. See you soon for my recap of Day 3!